From 1st July, India would be starting a new chapter in its financial history after the Goods and Services Tax (GST) rolls out. There would be many challenges, which both the business owners and the government officials have to face, chief of which is having to adjust to the new taxation norm that does away with indirect taxes like service tax and excise duty among others. The going might be tough for the initial 2-3 months and it is imperative that all those required to comply with GST regime go around learning about all the changes and inculcating them without any sort of panic. While there is always a resistance to change, what is not helping the matter at all is the misconception and propaganda being spread by some in the “commentariat”, who while possibly seeking to discredit the GST, might end up piling unnecessary panic among thousands of ordinary businessmen and taxpayers. These comments give a sense that businesses might end up investing a lot resources, especially man-hours, in just compliance. For example, reports claiming that businesses would need to hire dedicated professionals for GST management and upgradation. This isn’t something any business owner wants to hear, especially the ones who only have a turnover of about Rs 20 lakh per year. This article aims to put some clarity about this issue. One of the aspects that is scaring many is the claim that every company needs to pay 3 tax returns per month i.e. 36 tax returns per year, which will warrant a lot of paperwork and investment of man-hours. 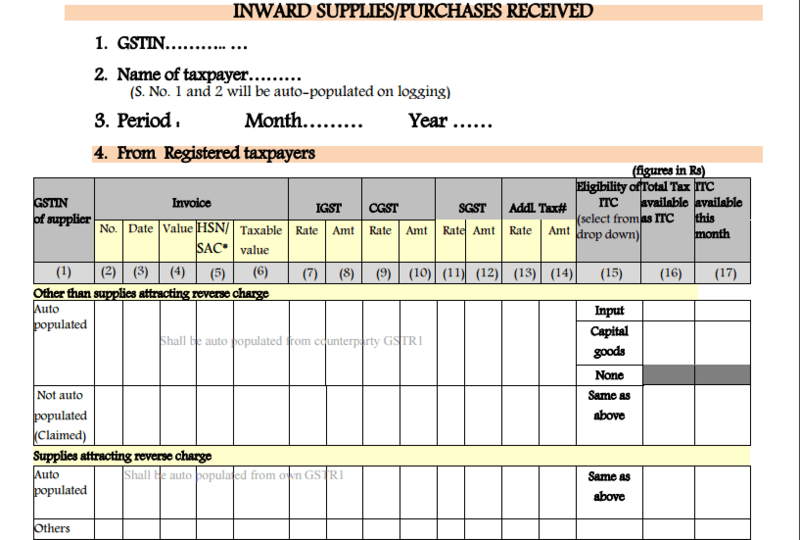 The tax-payer has to only file one return per month and the rest of the details get auto-populated. This was explained by me previously on Twitter. The only return that involves actual data entry is your outward return, which will be easy to do if your account keeping is orderly and systematic. The returns that get auto populated is your inward return, which fetches data from the return filed by your supplier. The other return that is auto generated is your monthly return, which fetches data from your outward return, which you fill in, and the inward return, which gets auto-populated. All these monthly returns would then be added on while creating an Annual return. Here also, as all the data is on the server, things would get auto-populated. One simply has to log-in and double-check the data, and press submit. As we have seen, while technically there are three returns, in essence it is only one return that a business has to work upon (the outward return). However, not everyone is required to do it. If you have a turnover of less than Rs 20 lakhs per annum, you literally don’t need to do anything. No need to file any sort of returns or even register under the GST, as you have been exempted under this act. Just concentrate on your business. Remember that in many states, the threshold for VAT was as low as turnover of Rs. 5 lakhs per annum, so GST actually does away with paperwork in many cases. If you have a turnover between Rs 20 lakhs and 75 lakhs per annum and if you have availed the “composite scheme” (explained later in the article), you just need to file quarterly returns and not monthly returns. Everyone else has to give invoice wise details of all sales of all transactions above Rs 2.5 lakhs. They also have to provide details of all sales and tax details: rate wise, inter-state wise, and intra-state for transactions below Rs 2.5 lakhs. This also would mean 1 return per month and auto-population follows. As clarified by revenue secretary Hasmukh Adhia earlier, the monthly returns named GSTR-2 and GSTR-3 are not actually returns. They are a computer-generated account of all your invoices as furnished by your suppliers. So after filing the 1st return, the government would send back two computer generated returns which need your verification and approval. He also lamented the fact that they didn’t name the forms as GSTR – 1A, 1B, 1C which clarifies that they are just three parts of a single return and not three different returns. It doesn’t mean that you don’t have to do any work. You do need to verify the entries and then approve those, which is not really a bad thing as we can see by the following example. Suppose you are working at a company that regularly deducts TDS from your salary, which it then pays to the government. Now when you receive your 26AS form, which details the tax you have paid to the government, you the check it to confirm whether your employer has actually paid the tax which he/she had deducted from you. If the correct TDS amount isn’t reflected in your 26AS form, you can confront your employer. The same applies to the GSTR-2 and GSTR-3 where the taxpayer would be able to ascertain whether if all the suppliers and dealers who had deducted the tax from him/her for paying to the government actually did so. Here there is no scope of editing or additions but its a mere reflection of the tax situation. But yes, the tallying does involve some work but there is a sweetener in the form of higher input credit which the GST offers. How does it all compare to the existing (pre-GST) tax regime? Currently, businesses need to file CST or central sales tax returns. Then they need to file VAT returns as per the laws prescribed by the state, which in most cases differed from state to state. So if a company operated in 20 states, it would have to keep in mind the 20 different VAT laws, and in order to do so appoint different consultants who have the knowledge of each state law before filing the return in each state. On top of it, there used to be entertainment taxes, road taxes, and others such taxes, which differed for state to state. In post-GST era, if a company is operating in 20 different states, it still have to file returns in each state as per the turnover slab it falls into. However, GST does ensure that all the state laws like VAT, entertainment tax, road tax, etc. which were different in each state, have been subsumed by a centralised GST law. Hence the company, while filing the returns, can very well refer to that single law to get things done rather than going through different state laws. So no more needing to appoint state specific experts for simple tasks like transporting machinery from one state to another, which earlier required the filing of road taxes in both the states having completely different road tax laws. Now just learn the GST law and you are good to go for everything. Even though GST may not completely simplify things, it is definitely is a step forward into a simpler tax regime. Also instead of spreading half truths and sensational stories, the critics can attack the government for last moment push and preparation. The sensational stories and various WhatsApp rumours are getting traction because the government has not managed to do enough when it comes to educating the citizens about the effect of GST and how they need to adapt to it. Now there are reports of the Finance Ministry setting up a war room when it comes to clarifying the doubts of state and central government employees after GST launches, but it raises the question as to why the employees are not already thoroughly versed with the inner-workings of the new tax. Also the government has set up GST awareness seminars across the country but the first one seems to have been held just this March, which is only 3 months before the actual launch date. The government should have launched awareness campaigns, put out educational advertisements in various regional dailies, set up GST information kiosks in every sub-division well before the launch date to nip such fear-mongering in the bud.